Ooey Gooey center, melted icream dripping down the sides, hot fudge drizzled on top. Do I have your attention yet? GOOD! You need to make this! 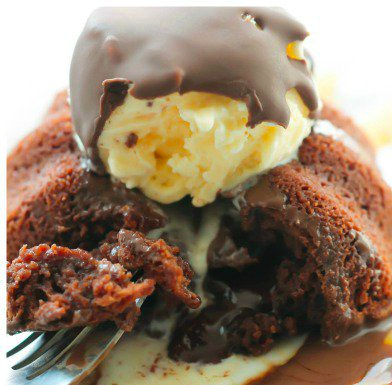 If you asked me my favorite dessert, I would tell you Chili’s Molten Lava Cake without any hesitation! I don’t know if anything gets better than moist chocolate cake with a gooey center topped with vanilla ice cream and chocolate shell topping. Seriously, it is perfection! 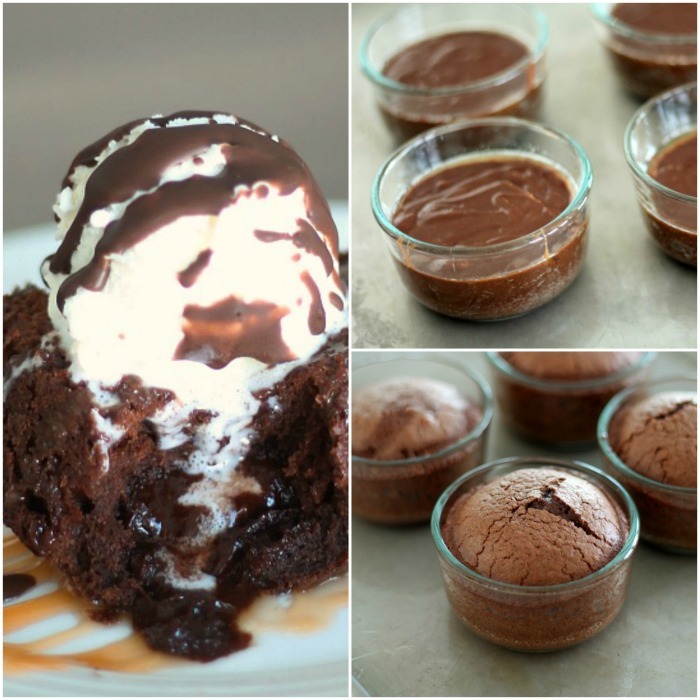 You’ll be shocked how easy this recipe is to make! So, we love this recipe so much that my Mom actually made 100’s of these to serve at Elyse’s Wedding Reception. When they cooled, she put them into freezer ziplock bags and stacked them in our huge freezer. Needless to say, that wedding reception food was by far my favorite food out of all of my sisters’ weddings! If you don’t have oven safe bowls, you can get some Pyrex bowls HERE. My Mom also used a muffin tin, but instead of making 4, she made 6 smaller ones. I would suggest buying Nestle, or Kroger Milk Chocolate Chips. They just tend to melt better in the microwave. Make sure you spray the bowls well with non stick spray, so they will come out easier. Bake on a cookie sheet. This is important just in case it goes over the edge! Then it will be on your cookie sheet instead of burning on the bottom of your oven. In a microwave-safe bowl combine chocolate chips and butter. Microwave for 2 minutes and whisk until smooth. Whisk in powdered sugar until combined. Add 3 eggs and 1 egg yolk, and whisk until combined. Add vanilla and flour and mix again. Generously spray four 1 cup oven-safe cups with cooking spray, and evenly fill with batter. Bake on a cookie sheet in the oven for 13-15 minutes until the outer edges are set and the center is still soft. Remove from oven and let cool for 2-3 minutes before inverting onto a plate drizzled with caramel sauce. Top cake with a scoop of vanilla ice cream and drizzle magic shell topping on top. Can you make and hold the cooking? I'm confused. What makes the "lava" inside? The warm runny chocolate that's inside the cake???? It just happens with the ingredients! Trust us! This is one of our favorite dessert recipes. I just made this and it was yummy ? What size of the egg? Medium or large? We always use large eggs. When your mom made these and froze them, how did she warm them for the reception? It's just my husband and I and he does not eat dessert. And fortunately I cannot eat all of them myself LOL. I don’t understand what makes the runny center. It was just a cake and not super goey either when completely cooked. It must have been I put the cake in the oven a minute or two longer. How long should I cook them in a muffin tin? You will kind of have to keep an eye on them. It will be less cooking time. Cook until the outer edges are set and the middle is still kind of soft. Is it possible to make this dairy free? 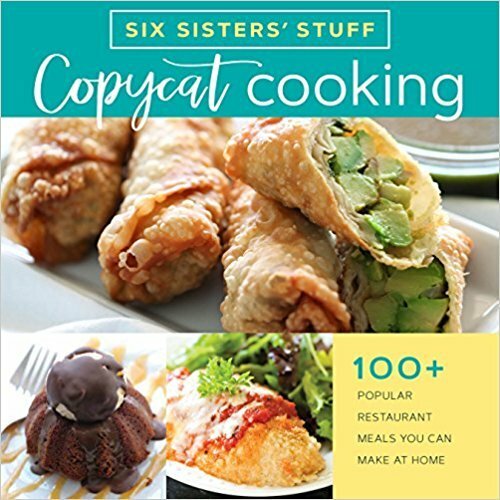 Could I use coconut oil or Crisco instead of butter? I have dairy free chocolate chips. We have not made this recipe using coconut oil or Crisco. So we can't give you an accurate answer. But if you have used it as a substitute before in a cake recipe that is similar, it will probably work out fine.